Thaddeus “Tad” S. Mizwa, born in Springfield, Massachusetts on July 4, 1927, passed away peacefully on April 3, 2019 at the age of 91. He was the son of Katherine Twarog and Stephen Paul Mizwa, who founded and was president of The Kosciuszko Foundation in New York City. Tad served on its Board of Trustees until the fall of 1970. Tad graduated from Amherst in 1949 with a Bachelor of Arts and then received a Master of Arts from Teachers College, Columbia University. He later became an accomplished trick roper and leather tooler. He studied under the best to become a world renowned saddle maker. Tad owned Tad’s Saddlery And Western Wear in Highland Village in Houston from 1953-1962. Tad did post-graduate work in the spring of 1963 at the University of Houston in journalism. Tad was the editor of the Conroe Courier from 1963-1967. In 1967, he moved his family back to Houston to join Cordovan Corporation and became the advertising manager and editor of Horseman Magazine. Tad eventually developed and published Western Outfitter for the western apparel trade. He later became the publisher of Texas Fisherman and Jet Cargo News within the Cordovan Corporation umbrella. 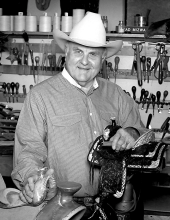 Tad authored three books in the area of western merchandising, and “A Lifetime with Boots” with Sam Lucchese. He received the President’s Award and two Silver Spur Awards from the Western & English Manufacturers Association, and the “Al” Bronze Statue Award from the Western & English Retailers of America, all for outstanding services and contributions to the western industry. Tad also served on many committees with the Houston Livestock Show & Rodeo Association. He was an Elder of First Presbyterian Church of Houston, Texas, and was a baritone in the Chancel Choir for over 40 years, which he loved dearly. When he “retired” he volunteered for Aids Foundation-Houston, Stone Soup and Nehemiah Center, all while starting up his saddle making again. He perfected historical life size and 40% scale miniature saddles commissioned by various museums in the U.S., including making full-size and miniature replicas of a conquistador, a vaquero and a trail riding saddle for the Witte Museum of San Antonio’s exhibit, “Thundering Hooves-500 Years of Horsepower.” That exhibit traveled all over the country. He moved with wife Mary Jane to Leona, Texas in 1999, where Mary Jane’s family settled in the late 1800’s. They built a large ranch house with a 1500 square foot leather shop. There, Tad continued to hand-craft 40% miniature saddles which found their way to collectors around the world and into the homes of many friends and family. His Tom Mix miniature saddle was part of The Story of Texas exhibit in the Bob Bullock Texas State History Museum, which opened in Austin, Texas in April, 2001. It was on display until May, 2004. Tad's work both in full size and 40% miniature saddles has appeared in six museum exhibits since 1993. After 60 years of perfecting his leatherworking craft, which included 52 miniature saddles, a stroke in 2003 abruptly ended his leatherworking for good. Yet Tad never complained. He continued writing western articles and mentoring up and coming leather craftsman. Tad was predeceased by his parents Katherine Twarog and Stephen Paul Mizwa, his first wife of 10 years, Genevieve Brunoski-Mizwa, wife of 50 years, Mary Jane House Mizwa, and sister Helen Mizwa Reynolds. He is survived by son John Mizwa, son Michael Mizwa and wife Mary Johnston Mizwa, daughter Michelle Mizwa Eutsler and husband Robert Eutsler, and son Stephen Mizwa and wife Delia Escalante Mizwa, all of Houston, Texas. He is survived by grandchildren Rob Eutsler, Mary Elizabeth Browne Attwood, Baird Eutsler, John Browne, III, William Johnston, Hannah Mizwa, Kayla Mizwa, Holly Mizwa and John “Tad” Mizwa, great-granddaughter Emma Attwood, and his beloved nieces, nephews and cousins. Our family graciously appreciates the excellent care that Tad received from the staff at Memorial Hermann Hospital in the medical center and Houston Hospice –Holcombe. Funeral Services will be held at 1:00 p.m. on Saturday, June 1, 2019, at Evans Chapel United Methodist Church, located at 4133 FM 977 West, Normangee, Texas (4 miles west of I-45 at Leona, Texas). In lieu of flowers, donations can be made in Tad’s name to The Lord’s Pantry-Leona, P.O. Box 101, Leona, Texas, 75850, Evans Chapel Cemetery Fund, 8167 CR 410, Normangee, Texas 77871, and AIDS Foundation Houston, 6260 Westpark Drive, #100, Houston, Texas 77057. To send flowers or a remembrance gift to the family of Thaddeus S. "Tad" Mizwa, please visit our Tribute Store. Guaranteed delivery before Thaddeus's memorial service begins. "Email Address" would like to share the life celebration of Thaddeus S. "Tad" Mizwa. Click on the "link" to go to share a favorite memory or leave a condolence message for the family.